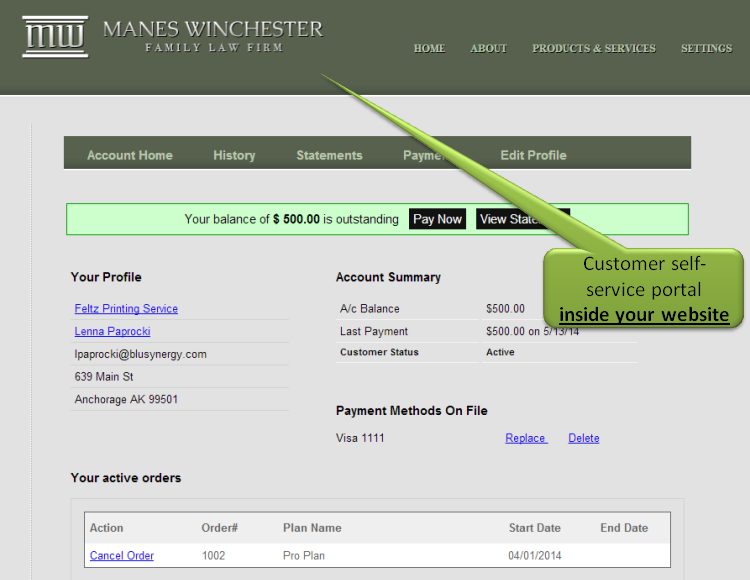 The Hosted Self-Service Pages allow you to embed the "My Account" functionality from BluBilling into your own website. This allows your customer to perform self-service activities such as view their account balances and status, current and past invoices, make payments, etc. All of these self-service screens are already built into BluBilling, and may be quickly deployed within a framed page on your own website so that you maintain brand presence with your customer by keeping her on your own website. Single Sign On (SSO) Option - In this model, your customers have already logged on to your application/website using a set of credentials that is managed outside BluSynergy. Your application/website handles the authentication of the customer, and makes an API call to indicate the particular customer for whom the self-service portal is to be shown. BluSynergy Login Option - in this model your customers login using their BluSynergy userid and password. This greatly simplifies the integration, and no API calls are required. Simply create a iframe on your webpage and set the iframe source to https://yourcompany.blubilling.com/widget/login. The remainder of this document refers to the SSO option. Using the default navigation elements provided inside the framed content. 1 cssURL The CSS to use for styling the framed page. This permits the look and feel of the hosted payment page (i.e., the content within the iframe to match the look and feel of the framing website. To use the default BluBilling CSS, specify "/css/signup.css"
2 customerId The BluSynergy assigned (internal) customer id. 4 showNavigationBar true or false. If true, then the BluBilling application (i.e., framed pages) will show the navigation menus for "Statements", "Payments" and "Add a Payment Method" (see the screens below). If false, then your application (i.e., outer frame) will be responsible for displaying the navigation structure that allows the user to navigate between Invoices/Payments/etc. 12 profile Profile ID of self service configuration. E.g., "profile=SALESFORCE". Note: The link is valid for 30 minutes after which it expires. This causes the browser to display the webpage with the iframe content. The picture below shows the sample login. On the other hand, if you are set showNavigationBar=false and showStatements =true&showPayments=true in the querystring, then BluBilling won't show the navigation bar and you can control the "My Statements" and "My Payment" menus from outside the iFrame. Some additional screen shots of the pages within the iframe are shown below.